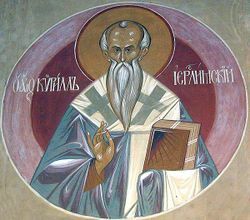 Our father among the saints Cyril of Jerusalem (315-386) was a distinguished theologian and archbishop of Jerusalem in the early Church. He is celebrated by the Orthodox Church on March 18, and on May 7 for his role in the apparition of the cross over Jerusalem in 351. Little is known of his life before he became bishop; the assignment of the year 315 for his birth rests on mere conjecture. He seems to have been ordained deacon by Bishop Macarius of Jerusalem about 335, and priest some ten years later by Maximus. Naturally inclined to peace and conciliation, he took at first a rather moderate position, distinctly averse from Arianism, but (like not a few of his undoubtedly orthodox contemporaries) by no means eager to accept the uncompromising term homoousios. Separating from his metropolitan, Acacius of Caesarea, a partisan of Arius, Cyril took the side of the Eusebians, the "right wing" of the post-Nicene conciliation party, and thus got into difficulties with his superior, which were increased by Acacius's jealousy of the importance assigned to Cyril's see by the First Council of Nicea. A council held under Acacius's influence in 358 deposed Cyril and forced him to retire to Tarsus. At that time he was officially charged with selling church property to help the poor, although the actual motivation appears to be that Cyril was teaching Nicene and not Arian doctrine in his catechism. On the other hand, the conciliatory Council of Seleucia in the following year, at which Cyril was present, deposed Acacias. In 360 the process was reversed through the metropolitan's court influence, and Cyril suffered another year's exile from Jerusalem, until Julian the Apostate's accession allowed him to return. The Arian emperor Valens banished him once more in 367, after which he remained undisturbed until his death, his jurisdiction being expressly confirmed by the First Council of Constantinople (381), at which he was present. At that council, he voted for acceptance of the term homoousios, having been finally convinced that there was no better alternative. Though his theology was at first somewhat indefinite in phraseology, he undoubtedly gave a thorough adhesion to the Nicene orthodoxy. Even if he does avoid the debatable term homoousios, he expresses its sense in many passages, which exclude equally Patripassianism, Sabellianism, and the Arian formula "There was a time when the Son was not." In other points he takes the ordinary ground of the Eastern Fathers, as in the emphasis he lays on the freedom of the will, the autexousion, and his imperfect realization of the factor so much more strongly brought out in the West—sin. To him sin is the consequence of freedom, not a natural condition. The body is not the cause, but the instrument of sin. The remedy for it is repentance, on which he insists. Like many of the Eastern Fathers, he has an essentially moralistic conception of Christianity. His doctrine of the Resurrection is not quite so realistic as that of other Fathers; but his conception of the Church is decidedly empirical—the existing catholic Church form is the true one, intended by Christ, the completion of the Church of the Old Testament. His doctrine on the Eucharist is noteworthy. If he sometimes seems to approach the symbolical view, at other times he comes very close to a strong realistic doctrine. The bread and wine are not mere elements, but the body and blood of Christ. His famous 23 catechetical lectures (in Greek, Katecheseis), which he delivered while still a presbyter in 347 or 348, contain instructions on the principal topics of Christian faith and practise, in a popular rather than scientific manner, full of a warm pastoral love and care for the catechumens to whom they were delivered. Each lecture is based upon a text of Scripture, and there is an abundance of Scriptural quotation throughout. After a general introduction, eighteen lectures follow for the competentes, and the remaining five are addressed to the newly baptized, in preparation for the reception of Holy Communion. Parallel with the exposition of the creed as it was then received in the church of Jerusalem are vigorous polemics against pagan, Jewish, and heretical errors. They are of great importance for the light which they throw on the method of instruction usual in that age, as well as upon the liturgical practises of the period, of which they give the fullest account extant. As an illustrious pillar of the Apostles' faith. And dispensing their talents of wisdom. O Cyril, our Father and hierarch, pray for us. Undivided in essence, yet divided in Hypostases. Offering you as our intercessor before God. Initial text from Schaff-Herzog Encyc. of Religion. This page was last edited on March 21, 2017, at 02:06. This page has been accessed 34,900 times.